General maintenance includes clearing the surface of debris as well as any furniture. Clear off any clutter and put away planters and furniture that could accumulate moisture and cause wood discolorations. Next, scrub it the deck. Dirt and debris that’s left behind can rot the deck surface, causing deterioration. After the general cleaning, look for any areas of mildew or mold buildup. Be sure to check in cracks and between tight boards. Once you have removed any of these, then a good rule of thumb is to have a water repellant applied that will seal the surfaces. In the future, you may have to get prior finishes removed, especially if they are cracked or peeling. Come spring, you will be glad you took the time for this extra step when you will again be able to enjoy a good-looking deck. If it is possible, you may want to cover the deck with a tarp. This will add an additional barrier that can help keep moisture from getting in the cracks and can prevent warping because of ice formation. This can also help keep the snow from accumulating on the deck and possibly ruining your deck’s finish. If you do not take the time to tarp your deck, be sure to remove any snow before it freezes and builds up. If you follow these simple suggestions, you and your family and friends can enjoy your wood deck season after season. 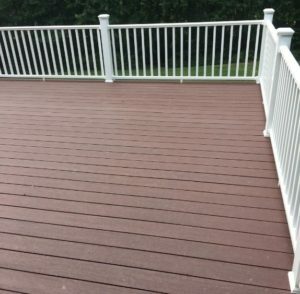 Remember to keep your deck in pristine condition by properly protecting it against the harsh winter elements in your area. For help protecting and sealing your wood deck or for wood deck replacement and repair services give us a call at Nu-Face Home Improvements or click here for a free quote.